The World Council of Churches says it's about inclusiveness and Christian unity but a new report claims the organization is also behind a very controversial program. 세계교회협의회는 이 프로그램이 포괄성과 기독교 통합에 관한 것이라고 밝혔지만, 새로운 보고에 따르면 이 단체는 또한 논란이 많은 프로그램의 배후에 있다고 합니다. yeah reportedly young Christians are being sent to the West Bank as observers, but return home is anti-Israel advocates. CBN Middle East correspondent Julie Stahl has that story from Jerusalem. 보고에 따르면 젊은 크리스천들이 관찰자로서 서안지구에 보내진다고 합니다만, 집으로 돌아오는 사람들은 반-이스라엘 지지자라고 합니다. 중동 씨비엔 뉴스의 특파원 줄리 스탈에 예루살렘에서 이 이야기를 전해드립니다. This effort is called the ecumenical accompaniment program in Palestine and Israel or EA PPI. the World Council of Churches started the program in 2002. since then it sent some 1800 volunteers to the West Bank to witness what it calls life under occupation. 이러한 노력은 팔레스타인과 이스라엘에서 아니면 EAPPI에서 전기독교적 동반 프로그램입니다. 세계교회협의회는 이 프로그램을 2002년에 시작하였습니다. 그 후로 1800 명의 자원봉사자들을 웨스트 뱅크에 보내는데 소위 점령하에 있는 삶을 목격하게 하기 위함입니다. These volunteers then head home to tell churches congregations and others aboutit. Those presentations often take a very negative and even anti-semitic tone. 이 자원자들은 교회의 모임에 가서 활동을 하는데, 종종 매우 부정적이고 회의적인 목소리를 담고 있습니다. It has got nothing to do with it. it is mainly a political warfare it is mainly driven by this by design. this is, it is a Zionist ideology to try and drive every palestinian out of that land to create a Jewish state. 아무것도 할 것이 없습니다. 이 활동은 주로 정치적인 전쟁을 의미합니다. 이 형식에 의해 진행되고, 모든 팔레스타인인들을 그 땅에서 몰아내 새로운 유대 국가를 만드는 것은 시오니스트적인 사상입니다. The WCC denounces anti-semitism as a sin against God and spokesperson Peter probe tells CBN News that the program is all about human rights. WCC는 반-유대인풍을 하나님에 대한 죄라고 비난하였고 대변인 피터 프로브는 CBN 뉴스가 인권을 다루고 있다고 말하였습니다. The ultimate purposes of the program are to address human right violations impacts upon human dignity and to promote from the positive side a just peace for both peoples. 이 프로그램의 궁극적인 목표들은 인간의 존엄성에 미치는 인간의 권리 침해에 대해 다루고 긍정적인 측면으로부터 두 민족의 정의로운 평화를 촉진하는 것입니다. A report by the NGO monitor however paints a different picture of these so called training camps. 하지만 NGO 모니터의 보고서는 소위 훈련 캠프라고 불리는 이들의 다른 그림을 그립니다. 그리고 그것은 교회 단체와 교회 내에서 반이스라엘 운동가들을 훈련시키기 위한 주요 방법입니다. and it's also the main tool for inserting anti-Israel and anti Zionist propaganda and rhetoric into those same churches. 그것은 또한 반이스라엘과 반 시오니즘의 선전과 미사여구를 같은 교회에 주입하는 주요한 방법입니다. According to probe, the volunteers take part in everyday life with the Palestinians. 조사에 따르면, 자원봉사자들은 팔레스타인 인들과 함께 일상 생활을 합니다. Provide a protective prisons secondly. They're there to observe monitor and report on events that they observe. 두 번째로 보호감호소를 제공해야 합니다. 그들은 그들이 관찰한 사건들을 감시하거나 보고하기 위해 그곳에 존재합니다. Jonas Schiff Miller said NGO monitor found there's more to the story. 죠나스 쉬프 밀러는 NGO 감시단이 더 많은 사연이 있다는 것을 알았다고 합니다. 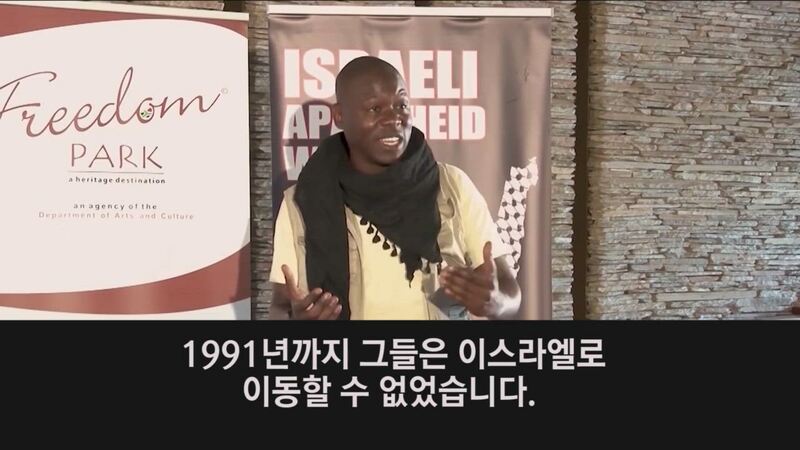 In fact, what EAPPI is really doing is coming here and gaining credibility for themselves to go back to their home churches and to spread anti-Israel diatribes. 사실, EAPPI 가 정말로 하고 있는 일은 여기 와서 그들 스스로 고향 교회로 돌아가 반이스라엘 이주민들을 퍼뜨릴 수 있는 능력을 키우는 것입니다. Yosef de Jerez coordinator of the Jerusalem Center that hosts the volunteers. He explains how they view Jesus command to love your enemies. 자원 봉사자들을 모집하는 예루살렘 센터의 요세프 드 예레즈 코디네이터는 그들이 예수님이 적들을 사랑하라고 한 말씀을 어떻게 보는지 설명합니다. We look at the Israelis of course as our enemy and we see that our enemy is in sin against God and against humanity. And in order to show our love-if you love someone you would love him to be free of his sin-so this is where we connected love with resistance. 우리는 물론 이스라엘 인들을 우리의 적으로 보고 우리는 적이 하나님과 인간성에 반한는 죄를 짓고 있는 것을 봅니다. 우리의 사랑을 보여주기 위해 만약 당신이 누군가를 사랑한다면 당신은 그가 죄에서 벗어나기를 바랄 것이고 이것이 저항과 사랑을 연결하는 부분입니다. Resistance usually refers to terrorism but Da Hare said as Christians, they only promote boycott divestment and sanctions movement or BDS. In a response to the report, the WCC said it only promotes boycotting goods from Israeli settlements. That's not Da Hares view. 저항은 보통 테러주의를 언급하지만 다 헤얼즈는 기독교인으로서 그들은 불매운동과 제재운동을 조장할 뿐이라고 말했습니다. 이 보고에 대한 응답으로 WCC는 그것이 이스라엘 정착촌에서 불매운동만을 조장할 뿐이라고 했습니다. 그것은 다 헤얼즈의 견해는 아닙니다. Our call for sanctions is targeted at Israel. 우리의 제재 요구는 이스라엘을 타겟으로 한 것입니다. The WCC recognizes Israel's right to exist according to international law, but doesn't connect it to the Bible. WCC는 이스라엘의 존재 권리를 인정하는데 그것은 국제법에 따른 것이지 성경과 연관시켜서가 아닙니다. Dr. Robert Smith works with the volunteers and explained it earlier. 로버트 스미스 박사는 자원봉사자들과 일하고 그것을 더 먼저 설명했습니다. The biblical narrative of Israel has almost nothing to do with contemporary Israel other than the intentional manipulation of sacred texts to justify a political project. The global Kairos movement declared that any Christian theology that supports Zionism is heresy. 이스라엘에 대한 성경적 설명은 정치적 프로젝트를 정당화하기 위해 성경을 의도적으로 조작하는 것 외에는 현대 이스라엘과 거의 아무 관련이 없습니다. David Parsons is vice president of the International Christian embassy Jerusalem. He described the 2009 Kairos Palestine declaration as misguided. 데이비드 파슨스는 국제 기독교 대사관 예루살렘의 부회장이다. 그는 2009년 카이로스 팔레스타인의 선언이 잘못된 것이라고 말했습니다. For someone to Brand Ghin Zionism heresy. This is troubling ground because Jesus himself affirmed the restoration of Israel in Matthew 19. The Apostle Peter does it in Acts chapter 3 and Paul does it in Romans chapter 11 so these were all affirming a belief in biblical Zionism the belief that the Jews would be restored to the land. So are you calling Jesus himself a heretic? 이것은 예수님 자신이 마태복음 19장에서 이스라엘의 복원을 언급하셨기 때문에 골치거리 입니다. 사도 베드로가 사도행전 3장에서 사도 바울이 로마서 11장에서 그러했으며 이 모든 성서 시오니즘에 관한 믿음으로 유대인들이 언젠가는 자신들의 나라로 돌아갈 것이라는 믿음을 재 확안합니댜. 그래서 당신은 스스로 예수를 이단자라고 부르는 건가요? Funding for the volunteer training program comes from the World Council of Churches as well as European governments. NGO monitor would like those countries to re-evaluate that support and the WCC to recognize Israel's right to exist as a Jewish state. 자원 봉사 훈련 프로그램에 대한 자금 지원은 유럽 정부뿐만 아니라 세계 교회 위원회에서 옵니다. NGO 감시기구는 이 국가들이 그 지지와 WCC를 재평가하여 이스라엘의 유태국가로 존재할 권리를 인정하기를 바랍니다. Julie Staal ,CBN News, Jerusalem.